Αrgo Studios in Pythagóreio is an apartment building. 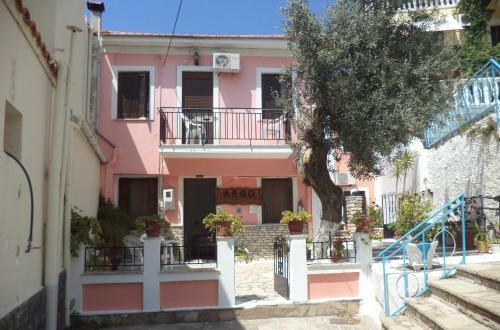 Argo Studios is located in the centre of Pythagoreio Town, less than 150 metres from the nearest beach. The property is a 3-minute walk from bars and ...restaurants. Free WiFi is available throughout. All air-conditioned studios have a balcony or terrace, kitchenette with refrigerator and coffee machine. Further facilities include a TV and bathroom with shower. Studios Argo is only 2 km from Samos International Airport. When would you like to stay at Αrgo Studios? Children and extra beds All children under 2 years stay free of charge for children's cots/cribs. All children under 6 years stay free of charge when using existing beds. The maximum number of children's cots/cribs in a room is 1. There is no capacity for extra beds in the room. Supplements are not calculated automatically in the total costs and will have to be paid for separately when checking out. Accepted credit cardsVisa, Euro/Mastercard, Cash. The accommodation reserves the right to pre-authorise credit cards prior to arrival. Please inform Αrgo Studios in advance of your expected arrival time. You can use the Special Requests box when booking, or contact the property directly with the contact details provided in your confirmation.